During Garver's office remodel in Norman, Oklahoma, several cubicles were removed and donated to Elite Kids USA in Oklahoma City. Elite Kids USA is using the cubicles as tutoring nooks to give students additional privacy during tutoring sessions. Elite Kids USA has started using its new tutoring spaces. 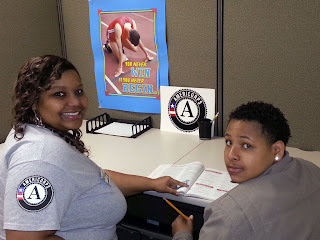 Pictured above, Laporshia Simms, Elite Kids USA AmeriCorps member, is working with William, one of the organization's youth. Elite Kids USA recently received an AmeriCorps grant to help fulfill its mission to help with youth literacy. Elite Kids USA is a non-profit organization that provides students with educational and health resources, youth mentoring and counseling services, and skill training. The tutoring program provides K-12 students with assistance in reading, literacy, math and test-taking skills. Garver is a multi-disciplined engineering, planning, and environmental services firm. We provide services for aviation, transportation, water, energy, industrial, development, federal, survey, and construction administration projects.